One of the most encouraging things parents can do for their children is to spend regular, scheduled special time with them. You may already spend lots of time with your children. However there is a difference between have to time, casual time, and scheduled special time. Children under two require a lot of time and are not really old enough to comprehend special time. As long as they feel your enjoyment, scheduled special time is not necessary. Between the ages of two to six, children need at least ten minutes a day of special time that they can count on. Even more time is better, but you’ll be surprised how magical it can be even if 10 minutes of special time is all you can manage in your busy schedule. From six two twelve, children may not require special time every day (you be the judge), but they like to count on at least half an hour a week. The particular time and amount would be individual for each family. It could be cookies and milk while sharing after school, or an hour every Saturday. The important part is that children know exactly when they can count on time that has been set aside especially for them. Don't be fooled when teenagers act as if they don't want to spend special time with you. At this age their friends are more important than family, but the older they get the more important family becomes. If your teenager doesn't have ideas for special time, you may need to make suggestions. Teenagers love to eat. Offer to take your teen to breakfast or lunch. Keep brainstorming until you find something they will look forward to. Children feel a sense of connection when they can count on special time with you. They feel that they are important to you. This decreases their need to misbehave as a mistaken way to find belonging and significance. Scheduled special is a reminder to you about why you had children in the first place—to enjoy them. When you are busy and your children want your attention, it is easier for them to accept that you don’t have time when you say, "Honey, I can’t right now, but I sure am looking forward to our special time at 4:30." Plan the special time with your children. Brainstorm a list of things you would like to do together during your special time. When first brainstorming your list, don’t evaluate or eliminate. Later you can look at your list together and categorize. If some things cost too much money, put them on a list of things to save money for. If the list contains things that take longer than the 10 to 30 minutes you have scheduled for the special time, put these items on a list that can be put on a calendar for longer family fun times. I often suggest that parents take the phone off the hook for special emphasis that this is special, uninterrupted time. However, one mother would leave the phone on the hook during her special time with her three-year-old daughter. If the phone would ring, she would answer and say, "I’m sorry I can’t talk with you now. This is my special time with Lori." Lori would grin as she heard her mother tell other people how important it was to spend time with her. 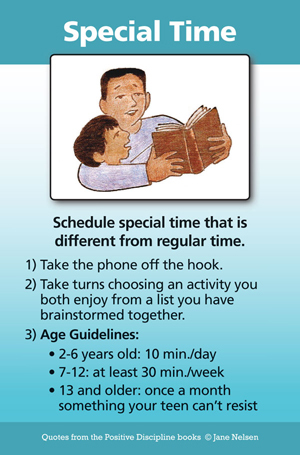 Parents can apply the concept of special time as part of the bedtime routine (although the bedtime routine should not replace daytime special time). When Mrs. Bruner tucks her children into bed at night, she asks them first to share the saddest thing that happened to them during the day and then the happiest thing. She then shares her saddest and happiest events. At first her children went overboard on this opportunity to complain about sad things and would sometimes end up crying. She would patiently wait for them to calm down and then say, "I’m glad you can share your feelings with me. Tomorrow, when you don’t feel so upset, we’ll talk about it some more to see if we can figure out some solutions. Now tell me your happiest thing." If the child couldn’t think of a happy thing, Mrs. Bruner would share her happy event. After the children got used to this routine, the sad events were reported in a matter of fact way, followed by ideas for solving or avoiding a similar problem in the future. The children soon enjoyed sharing their happy events more than their sad events. For an example of Special Time with Teenagers, listen to the podcast below.